Detective Brewer was a dear friend of mine and I miss him everyday. I just want to say thank you to everyone who took the time to leave their very kind words. Bill was a very special person who would stop everything he was doing to make sure everyone else was taken care of. He was the father we all want to be to our children and the husband we wish we could be to our significant other. Ed McConnell Asst Chief of Police Ret. Thanks for your service Detective Brewer and rest in peace. God bless you brother. Rest easy, we’ll take it from here. 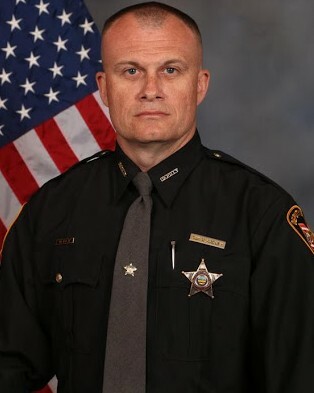 God bless you Detective Brewer, the Clermont County Sheriffs Department, and your family. Rest easy brother we have the watch from here. ~ Great love has no one than this than to lay down his life for his friends. To the family of Detective William Brewer, friends, Sheriff Robert S. Leahy and the Clermont County Sheriff's Office. On behalf of the Hillsborough County Sheriff's Office Honor Guard, we send our deepest sympathies and condolences. R.I.P. Detective Brewer, may God bless you and keep you. May God comfort your family, friends and all our brothers and sisters with the Clermont County Sheriff's Office. May God wrap you in his loving arms and grant your family and friends strength, comfort and peace during this difficult time. we will keep you all in our thoughts and prayers my brother. Please know that you and your service will never be forgotten. Fidelis Ad Mortem my brother as we remain Standing Tall For Those who Have Fallen. We have the watch from here. So sad to read this tragic news. Detective Brewer was a wonderful man who served our community for a long time, he is gone but will never be forgotten. I hope he can see down, and see how the community and law enforcement has come together in the thousands in support. Rest In Peace detective. God speed brother! Thank you for your service. My condolences to the family and friends of Detective William Brewer. Losing a loved one is always difficult. Please take comfort in Jesus words found at John 5:28,29 where he said that there would be a resurrection. Just think of the time when we will see our loved ones again, in paradise conditions, here on earth. Once again, I am sorry for your lost. Rest in peace Detective Brewer. My thoughts & prayers are with your family, friends, and the CCSO. Brewer family and friends may God grant you all with a speedy healing. Det.Brewer thank you for your Dedicated Service to your Community and to your Department. Most of all thank you for you Ultimate Sacrifice in the Line of Duty. My daughter, Deputy Reil Becker, knew Det. Brewer and is deeply saddened ! God bless him, his family and friends and all who serve ! Your service to your community will never be forgotten, Detective Brewer. Rest in Peace now, Brother. We've got the watch. Rest in Peace Detective Brewer. Thank you for your service.